Yalta is a sparkling Ukrainian city in Crimea, on the north coast of the Black Sea. Expats have secretly been lured here for a long time: the city is located on the site of an ancient Greek colony, said to have been founded by Greek sailors who were looking for a safe shore. Situated on a deep bay facing south towards the Black Sea, Yalta is surrounded by wooded mountains and it enjoys a warm Mediterranean climate. Due to that climate, this is also a great place to be if you enjoy good wine. With many vineyards and orchards in the vicinity, wine-lovers will rarely regret a stay in Yalta. Although English is not widely spoken in Crimea, it is understood by most young people. So American and British expats can come here even if they don’t speak much Russian. But a familiarity with the language would certainly help. Overall, though, the people are very friendly– and crime here is low. The summer season in Yalta can be particularly busy, since it is a tourist hotspot, though the rest of the year the tourists tend to filter out. 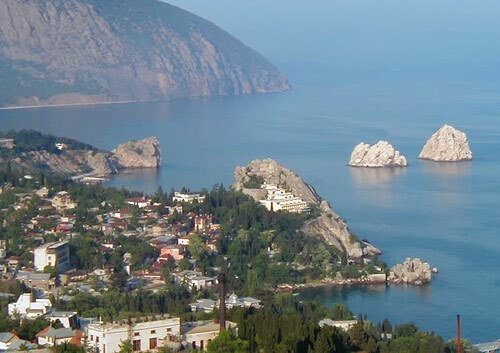 Permanent residents in Yalta only amount to around 80,000. Yalta’s beautiful embankment along the Black Sea makes it a great place to gather, talk, and people watch. There are several beaches on left and right sides from embankment, and the city also has a movie theater, drama theater, plenty of restaurants, and an open-air market. In the market, make sure to grab a few local red onions, which are famously sweet and expensive elsewhere in Ukraine. Of course, no Russian-influenced destination would be right without plenty of vodka, and Yalta is no exception. You will be amazed at the many varieties available. To get the best Vodka, take a visit to one or two of the supermarkets outside the city center and you will find a great selection at prices you will not believe. Things to see and do in town include a must-see Armenian Church built in 1909-1919 as a reflection of S. Hripsime Church built over a thousand years ago in Armenia. There are many carvings, arches and nooks, making this a very nice place to spend a little down time. Also see Chekov’s House where the famous writer wrote The Lady and Her Dog. A great place to kick back and read some Chekov is at the Nikita Botanical Garden, one of the world’s oldest operating scientific botanical gardens. Let’s face it, though– Yalta is worth it for the scenery alone. This is a beautiful coastline, with mild weather and good food and drink. Visit Yalta and see if you aren’t tempted to stay!